Archaeologists believe they have solved one ancient mystery surrounding the famous Easter Island statues. At 2,500 miles off the coast of Chile, the island is one of the world's most remote places inhabited by people. Up to 1,000 years ago, the islanders started putting giant red hats on the statues. The research team, from the University of Manchester and University College London, think the hats were rolled down from an ancient volcano. Dr Colin Richards and Dr Sue Hamilton are the first British archaeologists to work on the island since 1914. They pieced together a series of clues to discover how the statues got their red hats. 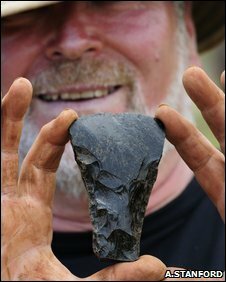 An adze, a road, and an ancient volcano led to their findings. Dr Richards said: "We know the hats were rolled along the road made from a cement of compressed red scoria dust." Each hat, weighing several tonnes, was carved from volcanic rock. 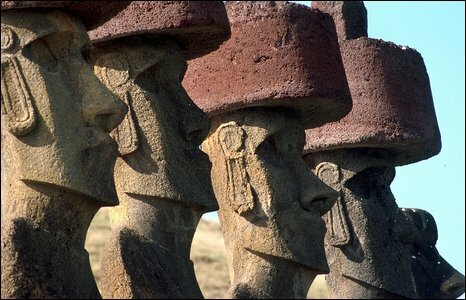 They were placed on the heads of the famous statues all around the coast of the island. However, precisely how and why the hats were attached is unknown. An adze was found in pristine condition next to the hats. The scientists think it might be an ancient offering. Dr Richards told BBC News: "These hats run all the way down the side of the volcano into the valley. "We can see they were carefully placed. The closer you get to the volcano, the greater the number. "It's like a church; you can't just walk straight to the altar. "The Polynesians saw the landscape as a living thing, and after they carved the rock the spirits entered the statues." Dr Richards and Dr Hamilton are joint directors of the "Rapa Nui (Easter Island) Landscapes of Construction Project". They will be working on the island over the next five years. Dr Richards added: "We will look to date the earliest statues. Potentially this could rewrite Polynesian history." Easter Island - a new wonder?